In this lesson, we will learn how to find the vertex of a quadratic equation. 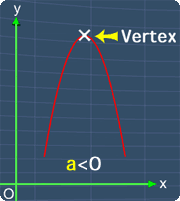 Learn what is the vertex of a quadratic equation. 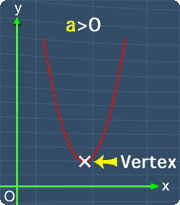 Learn the formula to find the x-coordinate of the vertex. See some examples on using the formula to find the coordinates of the vertex. Where a, b and c are the coefficients of each term respectively. Now, the graph of a quadratic equation will always have a highest point or a lowest point depending on the value of a. This point is called the Vertex. The pictures below will illustrate this. Vertex of a Quadratic Equation from MathExpression.com on Vimeo. In this lesson, we will learn about the vertex of a quadratic equation. Now, this is the graph of the quadratic equation, y= -x^2 +2x. Notice that, this is the highest point on the graph. Hence, this point is the vertex of a quadratic equation. Also, if you have a quadratic graph as shown here, the lowest point, is also the vertex of the quadratic equation, y = 2x^2 -8x +3. Now, there is a formula to calculate the x-coordinate of the vertex of a quadratic equation. The formula is, x = -b/2a. Now, what are 'a' and 'b'? Let's find out. The general equation of a quadratic equation is given as, y = ax^2 +bx, +c. Where, 'a', 'b' and 'c' are the coefficients for each term respectively. Let's see an example on using this formula, by using this equation, y = 2x^2 -8x +3. To find out the values of 'a', 'b' and 'c', we can rewrite this equation as, y = 2x^2 + (-8)x +3. By comparing this equation with the general equation, we can see that, 'a' is equals to 2, 'b' is equals to -8, and 'c' is equals to 3. Knowing this, we can substitute 'b', with -8, and substitute 'a', with 2. Now, we can simplify this term. Finally, we have x equals to 2. With this, we know that the vertex of the quadratic equation has the x-coordinate of 2. Let's go back to the original equation. Now, we can use the x–coordinate to find the y-coordinate of the vertex. To do so, we can substitute x with 2. -8 multiply with 2, gives -16. Adding -16 with 3, gives -13. Again, we can substitute x with 2. 2^2 is the same as, 2 multiply by 2. Which is equals to 4. Let’s write down this number. Let's continue. 2 multiply with 4, gives 8. 8 minus 13, gives -5. Hence, the vertex has y-coordinate of -5. This y-coordinate is located here. Hence, the vertex of the equation has the coordinates of (2, -5). Let's see another example. Consider the quadratic equation, y = -x^2 +2x. The graph for this equation is shown here. Now, the vertex is located at the highest point on the graph. Let's find the coordinates of this vertex. Again, we start with the formula for the x-coordinate of the vertex of a quadratic equation, x = -b/2a. To find the values of 'a' and 'b', we can compare this equation with the general equation, y = ax^2 + bx +c. For easier comparison, we can rewrite this quadratic equation as, y = -1x^2 +4x + 0. Hence, we can see that, 'a' is equals to -1, ‘b’ is equals to 2, and 'c' is equals to 0. Knowing this, we can substitute 'b' with 2 and substitute 'a' with -1. Let's simplify this term. Now, this term is the same as, -2/2(-1). 2 multiply by -1, gives -2. -2 divides by -2, gives 1. Hence, we have, x equals to 1. With this, the vertex has the x-coordinate of 1. Let's change back to the original equation. 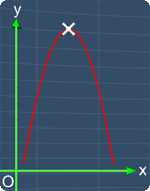 Now, we can use this x-coordinate to find the y-coordinate of the vertex. Here’s how. Substitute x with 1. 2 multiply with 1, gives back 2. Let's continue. Again, substitute x with 1. 1^2, is the same as, 1 multiply with 1. This gives 1. Let’s write this down. Finally, -1 add with 2, gives 1. Hence, the y-coordinate of the vertex is 1. This can be seen here. Hence, the coordinates of the vertex of this quadratic equation is (1, 1). You can start by going through the series of questions on vertex of a quadratic equation or pick your choice of question below.